The following problem appeared in an assignment in the Princeton course COS 126 . The problem description is taken from the course itself. 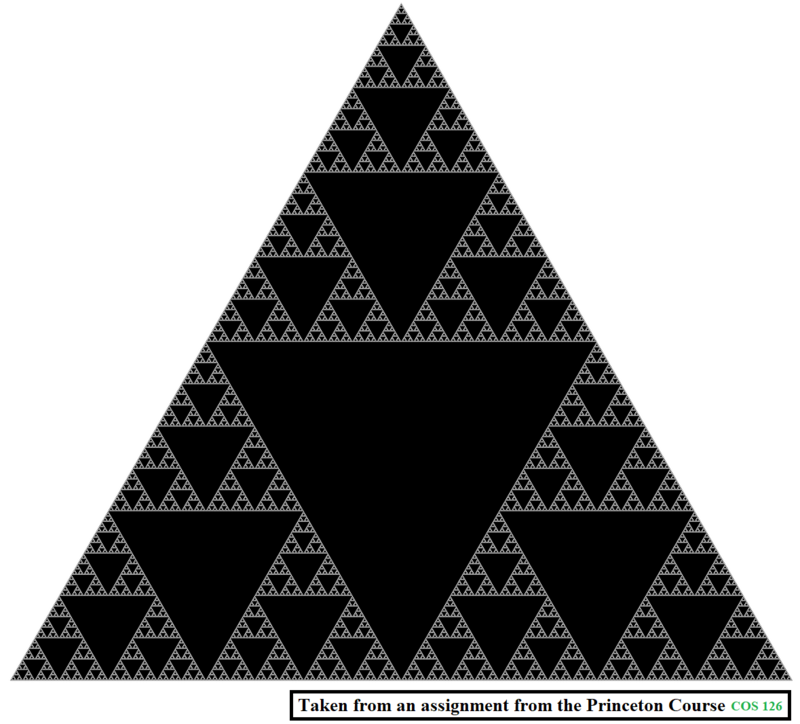 Write a program that plots a Sierpinski triangle, as illustrated below. Then develop a program that plots a recursive patterns of your own design. The Sierpinski triangle is an example of a fractal pattern. The pattern was described by Polish mathematician Waclaw Sierpinski in 1915, but has appeared in Italian art since the 13th century. Though the Sierpinski triangle looks complex, it can be generated with a short recursive program. Examples. Below are the target Sierpinski triangles for different values of order N.
Our task is to implement a recursive function sierpinski(). We need to think recursively: our function should draw one black triangle (pointed downwards) and then call itself recursively 3 times (with an appropriate stopping condition). When writing our program, we should exercise modular design. # Height of an equilateral triangle whose sides are of the specified length. return sqrt(3) * length / 2. # of the specified side length. # triangle has bottom vertex (x, y) and sides of the specified length. 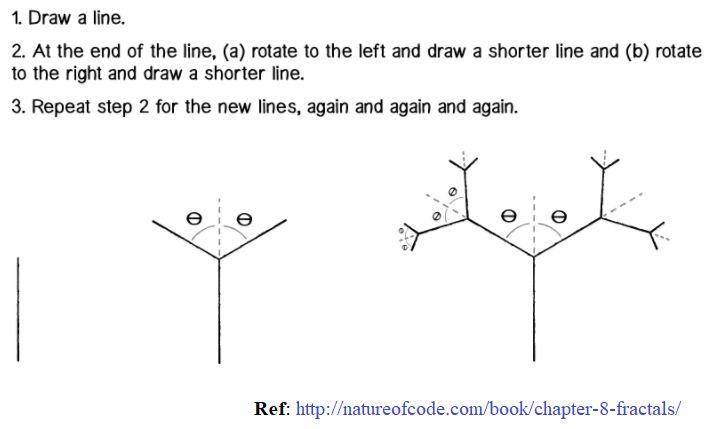 The following animation shows how such a triangle of order 5 is drawn recursively. The following animation shows how such a triangle of order 6 is drawn recursively. Formally, we can define the Hausdorff dimension or similarity dimension of a self-similar figure by partitioning the figure into a number of self-similar pieces of smaller size. We define the dimension to be the log (# self similar pieces) / log (scaling factor in each spatial direction). For example, we can decompose the unit square into 4 smaller squares, each of side length 1/2; or we can decompose it into 25 squares, each of side length 1/5. Here, the number of self-similar pieces is 4 (or 25) and the scaling factor is 2 (or 5). Thus, the dimension of a square is 2 since log (4) / log(2) = log (25) / log (5) = 2. We can decompose the unit cube into 8 cubes, each of side length 1/2; or we can decompose it into 125 cubes, each of side length 1/5. Therefore, the dimension of a cube is log(8) / log (2) = log(125) / log(5) = 3. We can also apply this definition directly to the (set of white points in) Sierpinski triangle. We can decompose the unit Sierpinski triangle into 3 Sierpinski triangles, each of side length 1/2. Thus, the dimension of a Sierpinski triangle is log (3) / log (2) ≈ 1.585. Its dimension is fractional—more than a line segment, but less than a square! With Euclidean geometry, the dimension is always an integer; with fractal geometry, it can be something in between. Fractals are similar to many physical objects; for example, the coastline of Britain resembles a fractal, and its fractal dimension has been measured to be approximately 1.25. The next problem appeared in an assignment in the Cornell course CS1114 . The problem description is taken from the course itself. Let’s consider a 2D matrix of values at integer grid locations (e.g., a grayscale image). 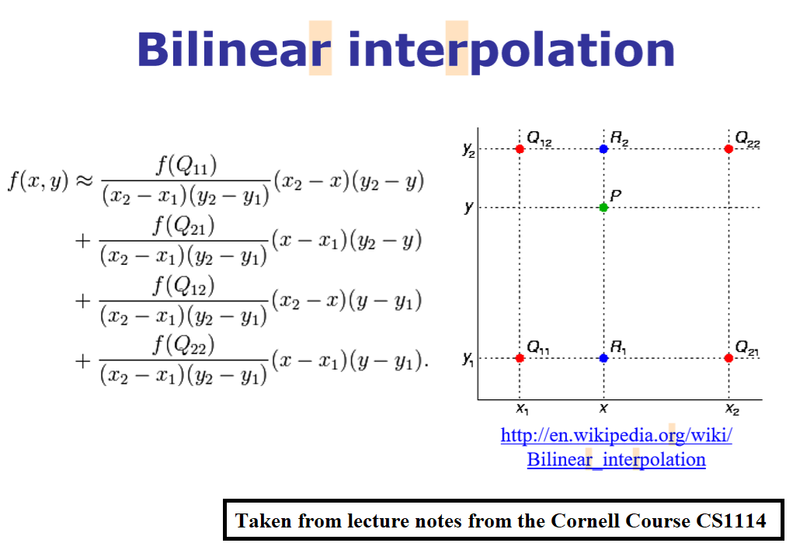 To interpolate values on a 2D grid, we can use the 2D analogue of linear interpolation: bilinear interpolation. In this case, there are four neighbors for each possible point we’d like to interpolation, and the intensity values of these four neighbors are all combined to compute the interpolated intensity, as shown in the next figure. In the ﬁgure, the Q values represent intensities. To combine these intensities, we perform linear interpolation in multiple directions: we ﬁrst interpolate in the x direction (to get the value at the blue points), then in the y direction (to get the value at the green points). Next, we’ll use the interpolation function to help us implement image transformations. To apply a transformation T to an entire image I, we could apply the transformation to each of I’s pixels to map them to the output image. However, this forward warpingprocedure has several problems. 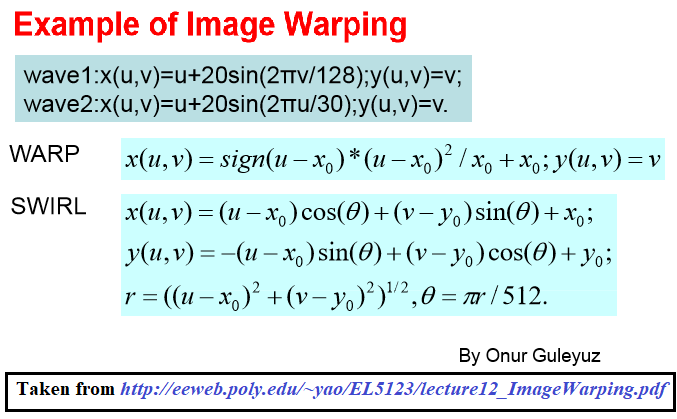 Instead, we’ll use inverse mapping to warp the pixels of the output image back to the input image. Because this won’t necessarily hit an integer-valued location, we’ll need to use the (bi-linear) interpolation to determine the intensity of the input image at the desired location, as shown in the next figure. Next, let’s implement a function to transform RGB images. To do this, we need to simply call transform image three times, once for each channel, then put the results together into a single image. Next figures and animations show some results on an RGB image. The next figures and animations show the application of the above non-linear transforms on the Lena image. There is a problem with our interpolation method above: it is not very good at shrinking images, due to aliasing. For instance, if let’s try to down-sample the following bricks image by a factor of 0.4, we get the image shown in the following figure: notice the strange banding effects in the output image. The problem is that a single pixel in the output image corresponds to about 2.8 pixels in the input image, but we are sampling the value of a single pixel—we should really be averaging over a small area. To overcome this problem, we will create a data structure that will let us (approximately) average over any possible square regions of pixels in the input image: an image stack. An image stack is a 3D matrix that we can think of as, not surprisingly, a stack of images, one on top of the other. The top image in the cube will be the original input image. Images further down the stack will be the input image with progressively larger amounts of blur. The size of the matrix will be rows × cols × num levels, where the original (grayscale) image has size rows×cols and there are num levels images in the stack. Now, for image k in the stack, we know that every pixel is a (weighted) average of some number of pixels (a k × k patch, roughly speaking) in the input image. Thus, if we down-sample the image by a factor of k, we want to sample pixels from level k of the stack. ⇒ Let’s write the following function to create image stack that takes a grayscale image and a number max levels, and returns an image stack. K = np.ones((3,3)) / 9. The next animation shows the image stack created from the bricks image. Now, what happens if we down-sample the image by a fractional factor, such as 3.6? Unfortunately, there is no level 3.6 of the stack. Fortunately, we have a tool to solve this problem: interpolation. We now potentially need to sample a value at position (row,col,k) of the image stack, where all three coordinates are fractional. We therefore something more powerful than bilinear interpolation: trilinear interpolation! Each position we want to sample now has eight neighbors, and we’ll combine all of their values together in a weighted sum. This sounds complicated, but we can write this in terms of our existing functions. In particular, we now interpolate separately along different dimensions: trilinear interpolation can be implemented with two calls to bilinear interpolation and one call to linear interpolation. Let’s implement a function trilerp like the following that takes an image stack, and a row, column, and stack level k, and returns the interpolated value. First compute the image stack. 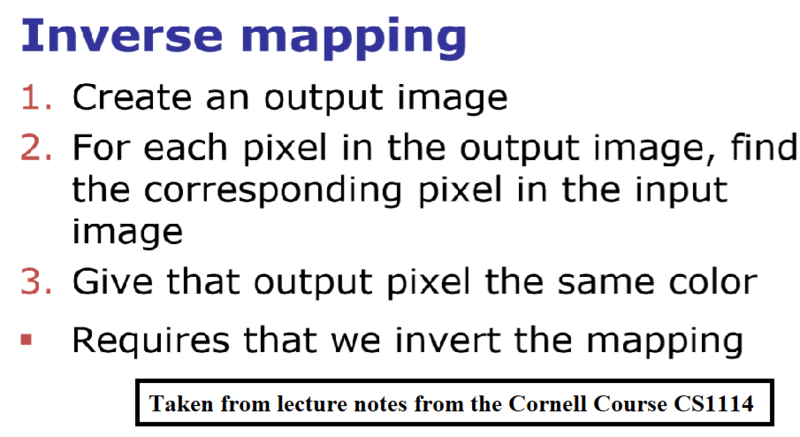 However, if k < 1 (corresponding to scaling up the image), we still want to sample from level 1. This situation reverts to normal bilinear interpolation. Next call the trilerp function on the image stack, instead of bilerp on the input image. As we can see from the above output, the aliasing artifact has disappeared. The same results are obtained on the color image, as shown below, by applying the trilerp function on the color channels separately and creating separate image stacks for different color channels.